This year fine-tune your presentation skills, learn how to create irresistible slide decks and make the most of the huge benefits SlideShare has to offer. I’d like to share with you what those benefits are for B2B small businesses and startups, the essential elements that make up a great presentation, how to upload your file so it can be found by your target audience, and what steps you can take to improve your presentation skills. But first, can I ask if you ever went fruit picking as a kid? I used to go to the strawberry fields quite regularly in Surrey and Sussex during the summer holidays: row upon row of bright red berries just waiting to be picked. I thought I was a pretty good fruit-picker. My general mantra was “One for the tub and one for me; one for the tub and three for me!” However, it wasn’t until my mother suggested that some of the best strawberries could be found underneath the leaves, where nobody else had bothered looking, that I became a ‘Master Fruit-Picker’. Sharing interesting, fresh and engaging content with your followers is an essential part of marketing in an effort to be seen as the ‘go to expert’ in a particular field. However, marketers tend to turn to the same old sources and expect to curate something new where others have already looked. According to CommsAxis only “around 17 percent of B2B marketers” search on SlideShare for content. That’s despite the fact that “SlideShare has had more than 10 million presentation uploads, drawing 70 million visitors and 3 billion views a month” [B2B Marketing Net]. Imagine having a vast City library full of resources but discovering that less than 20% of the population actually use it. That’s crazy! In terms of marketing your own slide decks on SlideShare, you have the potential to reach 70 million visitors per month who are in the process of searching for information you can provide. Surely this is an opportunity not to be missed? -Stand out from the Crowd: if you want your brand to stand out from your competitors, try doing something different! -Powerful marketing: SlideShare packs a very powerful marketing punch as it combines little nuggets of information with dynamic visual content. Short snappy messages are easily digested by today’s time-poor / attention-challenged consumers. -Mobile friendly: SlideShare is perfectly suited for mobile as well as desktop devices. -Social sharing: encourage users to share, download, embed your slides and ‘clip’ a slide to a Clipboard collection using the buttons provided. -Lead Generation: SlideShare allows clickable links to be included within slides, which is a perfect opportunity to include a strategic Call-to-Action. SlideShare also has its own native lead generation forms which are auto-filled using a reader’s LinkedIn details. -SEO Benefits: include keywords & tags to ensure your presentation is found by your target audience and indexed by Google. 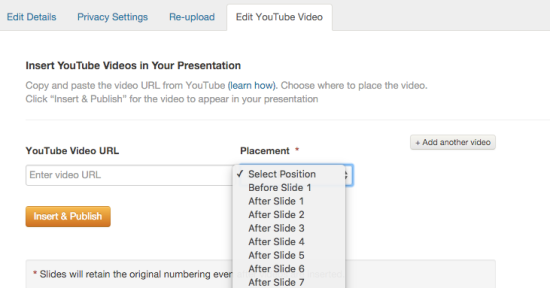 Upload a YouTube video at any point in your presentation for added SEO benefits. -Analytics: measure your ROI using SlideShare’s own analytics. It’s normal to feel hesitant or doubtful when embarking on something new. 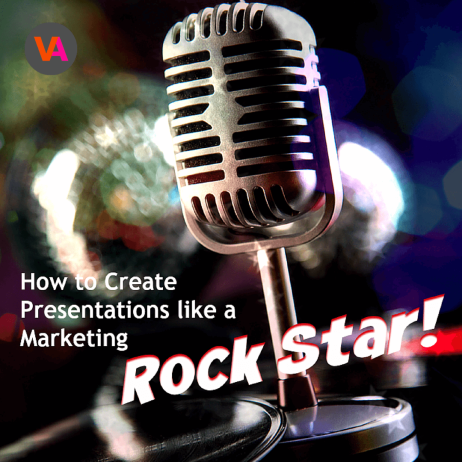 However, by breaking down the different elements that make up a great presentation, I’ll show you that you most likely have all the necessary skills needed already. 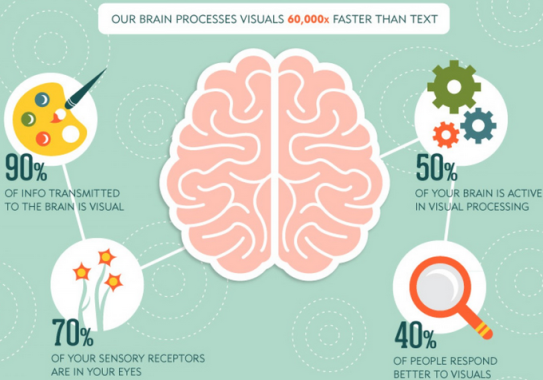 I’ve already written about the power of visual content and how humans are hard-wired to digest information visually. 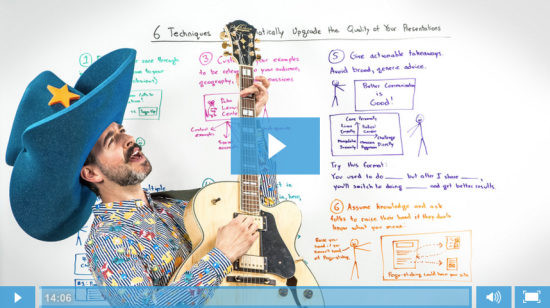 Consider this image of the’Wizard of Moz‘, Rand Fishkin from Moz. Rand’s style is definitely different and he’s used the power of humour to make a memorable impression. This slide uses shock and surprise to grab attention. The file name you use to save a presentation to your local files will become the URL when uploaded to SlideShare. As with blog headlines, think carefully about the kind of keywords you want to include in the file name. Keep the headline roughly 50 – 55 characters long (more than 55 characters and your headline will be truncated, as below). Ensure you include one or two relevant keywords that you want to rank for in the title. -Keep each slide simple and uncluttered: less is definitely more. -Choose 3 different fonts which are clear and easy to read: the first and largest for the heading; the second for any sub-points below it; the smallest for any links you add to a slide. Ensure you stick to these 3 fonts for every presentation so you that create a unique brand look and style. -Don’t allow any background images to overpower your text. -‘White space’ in a blog or presentation gives a crisp appearance and off-sets text and visuals very well, so don’t be afraid of using it. 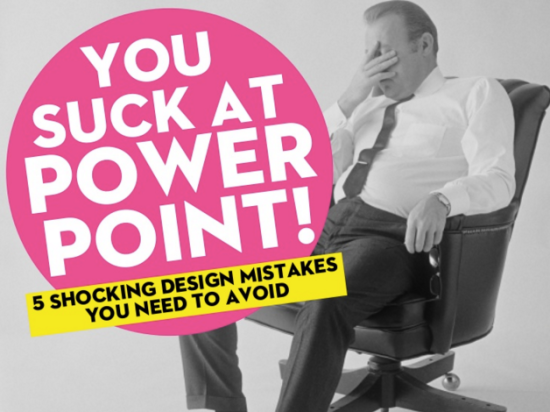 -Stick to one style throughout a presentation for continuity. Your slides will run effortlessly and smoothly from one to the next. Inserting internal links is a very powerful SEO technique and also introduces readers to new content they may have missed before. If you’re not going to be using SlideShare’s own native lead generation forms, you can still invite a reader to click on your own Call-to-Action and download a piece of content, as Donna Moritz from Socially Sorted has done below. Once you’ve uploaded your file onto SlideShare, you’ll need to input some key details in order to optimise your presentation for search. -File name – When saving your presentation to your local file, you’ll want to include one or two keywords as the file name becomes the URL when uploading to SlideShare. -Title – If you write a blog you’ll already be familiar with the art of writing a great headline to snag a readers’s attention and entice them to click through. -Description – The first 155 characters you write in the description box will be displayed in Google search much like Meta Data so think carefully about what you write here. -Tags – Like keywords, tags are very specific so think carefully about which words your audience would use to search for your content. SlideShare very generously allows you to use 20 tags. -Category – Browsers will start searching for content under broad categories so it’s not too difficult to choose which one is correct for your business. Under the “Privacy Settings” tab ensure your presentations can be viewed publicly, can be downloaded and that slides can be clipped to Clipboards. The beauty of using SlideShare is that browsers are already searching for specific content to meet their needs. 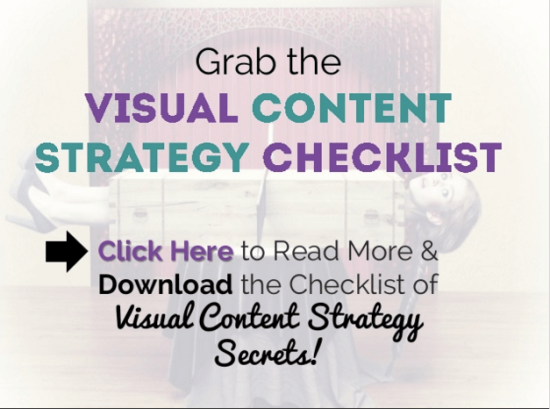 All you need to do is make sure your content is found and you capture their details with a strategic Call-to-Action. Alternatively, try SlideShare’s powerful lead generation tool. As SlideShare is owned by LinkedIn, lead gen forms are automatically filled in using a client’s LinkedIn details so little effort it needed on their part. The forms are customisable and can be viewed either on desktop or mobile. 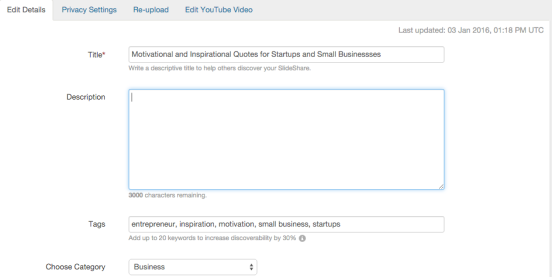 Combine the SEO benefits of SlideShare and YouTube by uploading a video into your presentation. Uploading couldn’t be easier. 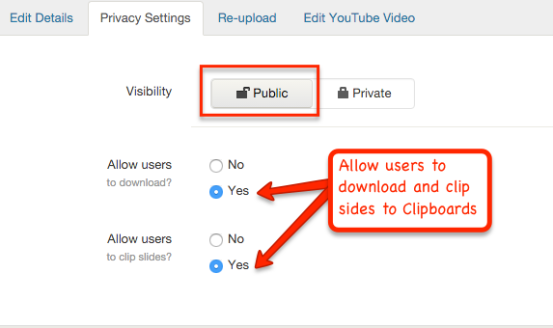 Copy and past the YouTube URL and select where you’d like the video to be included within the presentation. Again, all good marketers know the there’s little point in generating content unless they follow up and analyse their efforts with good analytics tools. Happily, SlideShare has its own native analytics tool so don’t let your efforts go to waste without measuring your ROI. Work out which slides are generating the most engagement and where your traffic is coming from. Mark Traphagen at Stone Temple Consulting wrote a comprehensive article about how to use SlideShare Analytics, which is well worth a read. 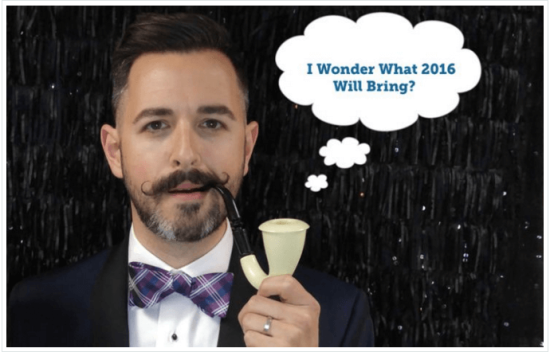 SlideShare’s Editor is always on the lookout for great presentations. If you’re lucky enough, yours might be picked to be showcased on the Editor’s homepage and shared over social media. This is a fun but powerful way to increase trust and awareness in your brand. I’ve unexpectedly found myself in such a position for two of my own presentations, “Bite-Sized Blogging Tips: the Key to Attention-Seeking Titles” and “19 Motivational & Inspirational Quotes." The first was viewed almost 5,000 times and was downloaded 116 times. Nicky Pasquier is the owner of Virtuoso Assistant, an award-winning UK small business. Nicky provides other start-ups and entrepreneurs with virtual assistance as well as specialist social media & marketing expertise. Connect with her on Twitter, SlideShare and Google Plus. This post was originally published on Virtuoso Assistant. Small edits have been made.